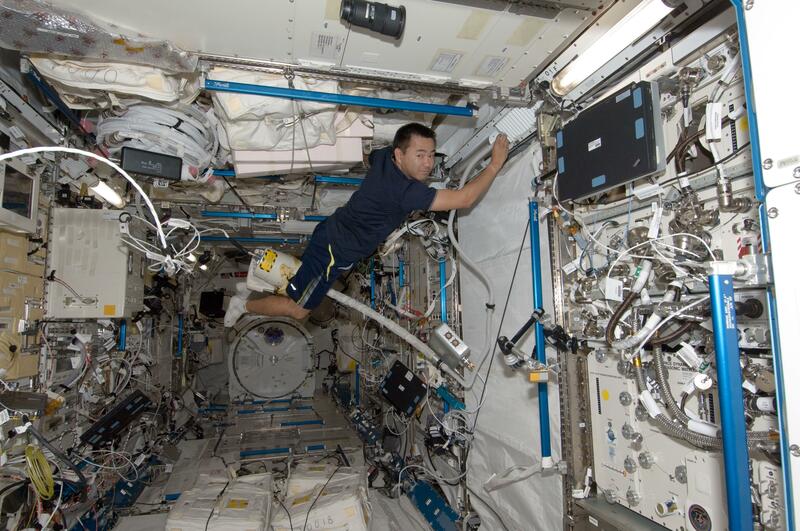 Do astronauts aboard the International Space Station have cleaning schedules? Astronaut Aki Hoshide uses a vacuum cleaner during housekeeping operations in the Kibo laboratory of the International Space Station on July 28, 2012. If I answer this question, please don’t tell my wife! You see, on board the International Space Station, we were scheduled to “clean” our home every Saturday morning. Since I was the only U.S. astronaut living on ISS at that time (June to November 2007), I was responsible for cleaning the entire U.S. segment. If she finds out I actually do cleaning, it could spell doom for me here in Houston. While ISS systems keep things reasonably clean automatically by sucking up all type of nastiness into awaiting HEPA filters, astronauts clean ISS for between two and four hours (per the schedule) every Saturday morning. I have to be brutally honest here and tell you that I did it in much less time than that, mostly because I didn’t do all of the tasks the ground requested. For example, every Saturday we were to wipe down all handrails, communication panels (known as audio telecommunication units), and a bunch of other stuff. I wiped them down, but not every Saturday. I only did it right before or right after a visiting crew was coming or had been aboard. My reasons were—at least in my mind—quite valid. You see, disinfectant wipes are a consumable, i.e., you can use them up. Consumables cost money, and the more you consume, the more frequently they must be replenished through a cargo ship delivery to space. With cargo mass being quite precious (not to mention expensive), I figured I was helping the program save money by reducing the consumption of consumables like disinfectant wipes and thus increasing the ability to send, say, more food or toilet wipes. Also, it made no sense to me to disinfect those things when 10 minutes later the other astronauts or I would sail through ISS like always, putting our grubby little hands all over everything. So I treated it much like I might here on Earth: Before and after visitors, I gave the place a thorough cleaning, but most Saturdays, it was a less focused effort. I’m sure after providing this answer the folks in mission control will be pretty pissed, but no one died or got sick because of it. Vacuuming of filters and vents I took more seriously. These places actually accumulated much gunk, leading to the possibility of reduced airflow in our very important ventilation system. Plus, it was easy to see progress as the powerful suction of the ISS vacuum cleaner provided instant gratification to my efforts. It was quite satisfying for me to see lint, dust, and 12-inch to 15-inch strands of hair disappear into the vacuum’s bag (also a consumable). I would vacuum up their hair every Saturday for the entire five months I lived aboard ISS. The key to living and working (and surviving) in outer space is to take care of your stuff. If you and your crew mates are diligent and form good habits about taking care of the things that are your responsibility, all will be well. I remember arriving back at ISS with the crew of STS-131 and observing the state of cleanliness and organization of the ISS Expedition 22/23 crews. I told T.J. Creamer that if he’d give me about an hour, I could have the place looking shipshape. I don’t think he appreciated that too much. Astronauts: How do astronauts deal with an itchy body part while inside the protective suits in space? Space Travel: What should astronauts avoid doing? NASA: How do astronauts feel when they watch the movie Gravity?